Even after 15 years of living in the UK, I’m surprised by my emotional response to the panorama that opens beneath me as the plane starts its descent into southeast Australia. While my fellow passengers are awestruck at the scale of the landscape that stretches out before them, it’s the thought of the tidal pools hammered out of rocks along the ocean’s edge that has me at the edge of my seat. Childhood weekends were spent splashing in such spots, delighting at the surf crashing over the barriers as I navigated my way through the salty, foamy water. Tidal pools are my favourite kind of wild swimming, and the best place to explore them is along the Melbourne to Sydney coastal route. Stretching some 700 miles, it carves its way through areas of outstanding beauty, offering up an array of ocean pools – but also charming beachside towns, fantastically fresh local produce and national parks with an abundance of wildlife, not to mention waterholes, waterfalls, lakes and lagoons. In Victoria’s vibrant state capital, Melbourne, shimmering high-rises jostle with iconic laneways, a dynamic arts scene spills out onto the streets and multicultural cuisine will satisfy every taste. But water babies should start with a visit to the seaside suburb of St Kilda, the city’s favourite oceanfront playground and home to its most famous stretch of sand. From there, continue south to the iconic Brighton Baths for a dip in an Olympic-size ocean enclosure. Established in 1881, today it forms part of a unique health club, but visitors are welcome too. Leaving the city’s limits behind you, detour to Phillip Island for a wildlife fix, passing through the lively town of San Remo on the way. Explore rock pools and paddle in sheltered bays, visit the Koala Conservation Centre and, at sunset, see penguins return to shore after a day’s fishing. Next up is Wilsons Promontory – ‘The Prom’ to locals. The most southerly point on your route, it’s a wild coastline with coves, cliffs and rocky outcrops. Head to secluded Fairy Cove, an isolated beach only accessible via a hike from Darby River or Darby Saddle. As you aim for the New South Wales border, pass through Croajingolong National Park, a quintessentially Australian mix of sand dunes and eucalyptus forests, rainforests and bushland, sparkling lakes and rivers, and footprint-free beaches. 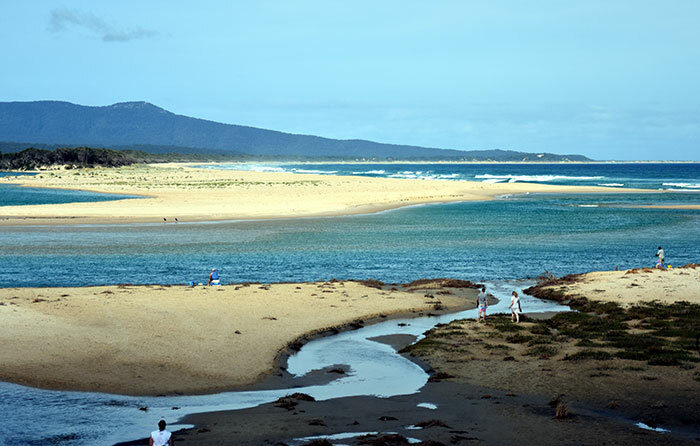 Seek out Elusive Lake, a two-mile hike from popular camping spot Wingan Inlet – cooling off in its pristine water is heavenly – and take time to relax at Mallacoota Inlet, a tranquil watery wonderland in East Gippsland. Crossing the border, head along the Sapphire Coast where the seaside towns of Eden, Pambula, Merimbula and Bermagui line your route. Visit artisan galleries, stock up on local cheeses and fresh bread, slurp oysters and spot whales out at sea. The area is also home to sheltered coves and excellent beaches, ideal for swimming and snorkelling. The Blue Pool at Bermagui, one of the most beautiful, expansive ocean pools in New South Wales, is located at the base of a dramatic cliff face. Built in the 1930s and upgraded in 2010, it’s a great choice for families. Pack a picnic and continue north, admiring the white-sand beaches of Jervis Bay as you go, then detour to the Gerringong Falls. 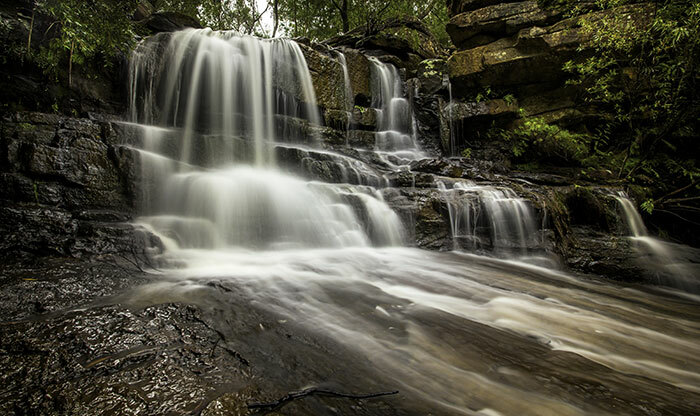 You’ll need to hike across uneven terrain to get there, but, set at the top of the falls, its pool rewards with stunning views over Kangaroo Valley. Back on the road, have a swim in one of Austinmer’s two ocean pools en route to the cantilevered Sea Cliff Bridge, which hugs the coast. Stop at Kellys Falls for a splash in a small, deep pool at the foot of the waterfall, and lounge on the rocks while the spray mists over you. Nearby, the Sri Venkateswara Hindu Temple is an unexpected find in quiet Helensburgh. a freshwater lagoon, a small beach and a lookout point. End your Journey in Sydney’s eastern suburbs, where the iconic Bondi Icebergs ocean pool needs no introduction. Take a stroll south along the coastal path – pausing to watch the surfers ride the waves as you go – and you’ll find other historical pools with incredible views. There’s Bronte Beach with its narrow tidal pool, and Clovelly, too, but the local favourite is at Coogee. 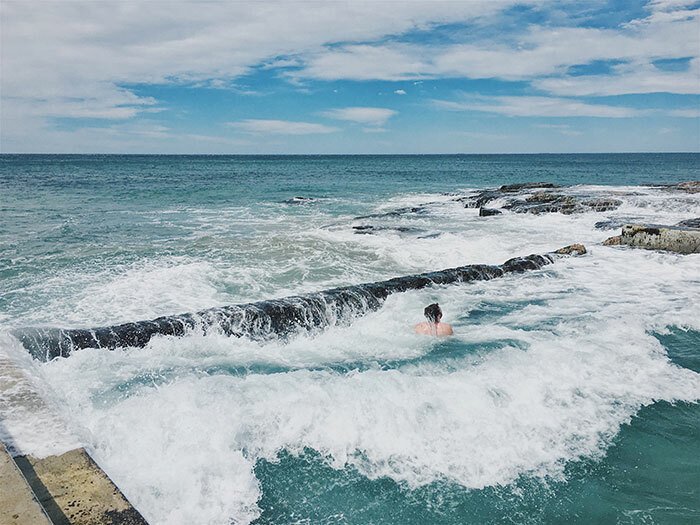 Built in 1907 and open all year, Wylie’s Baths has colourful decks, traditional changing rooms and a kiosk – grab a coffee and soak up the views of Wedding Cake Island, while planning your next splashing adventure. Inspired to explore Australia's swimming spots? Check out our range of tailor-made Australia holidays and book your Journey today.